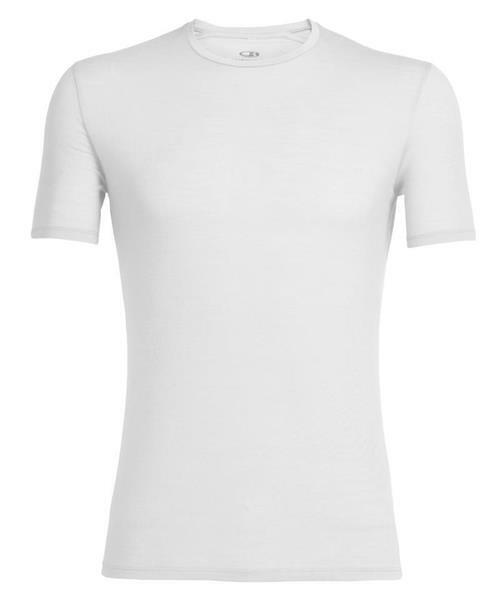 An ultralight T-shirt built with a super-soft, stretchy and highly durable merino wool blend, the Anatomica Short Sleeve Crewe provides the versatile, breathable comfort you need for both active pursuits and daily life. With an updated fit that makes it even more comfortable, the Anatomica Short Sleeve Crewe also feature Icebreaker's corespun fabric, which uses nylon fibers wrapped in merino wool for increased durability and strength that retains next-to-skin softness. Flatlock seams eliminate chafing when you’re on the move. Anatomica SS Crewe - Mens is rated 4.8 out of 5 by 28. Rated 4 out of 5 by RockyYYC from Best undershirts I've found I've tried so many undershirts that claim to "perform". These are without question the best. Words don't describe how well they breathe. I used to get cold or hot very easily wearing cotton or polyester. Merino helps maintain my temperature now whether I'm in a hot or cold environment. These undershirts literally made a huge improvement in my life. On the downside I found them very itchy at first, but the itchiness went away after washing them 2-3 times inside out. Also, they run quite small. I'm normally between a size small and medium but stepped up the the large in the Anatomica for the most comfortable fit. Worth every penny. Rated 5 out of 5 by EarlGrey from Great base layer or run/workout shirt Very happy with my shirt so far. The fit is certainly fitted. I usually buy Large size t-shirts and bought this in Large. I would be curious to see how the XL fits, but the "fittedness" of this shirt is great for a base layer or on its own for a run/workout. For casual wear I would size up to XL. It's very comfortable. It's not completely odor-free, but it's significantly more odor-free than say a regular cotton shirt, synthetic shirt (e.g., Nike Pro), or other wool products I've used. You could wear it for a couple of days camping, for example, and not notice much of an odor. Rated 5 out of 5 by merinoman7 from I wear these everyday, but I have one issue The photos don't always show whether the stiching on the side is a different color as the shirt itself. The blue shirt has white stiching! I wish the stiching was the same color, so it wouldn't stand out. Rated 5 out of 5 by unconspicuous from Great Quality and Good Fit I use this shirt instead of a jersey while riding my bike in hot weather as I don't like the feel of lycra/I like looking slightly more 'normal' while at a cafe. the fit is good, not smaller than labeled but definitely tight. an athletic fit. which makes sense for the intended use. very happy with this. Rated 5 out of 5 by CharlesT4 from My everyday shirt This is basically the only shirt I wear now. I just buy a few of them and switch between them. It is a great weight that can be worn year round. I've found the thicker weights can be itchy to wear. Rated 5 out of 5 by PatrickHart from Great Undershirt I struggle finding good fitting and comfortable undershirts. This shirt is both comfortable and fits great! I am glad I bought 2! Rated 5 out of 5 by Woolrocks2 from Woolrocks2 Another super comfortable, highly functional piece of IceBreaker clothing. Not my first and won’t be my last! Great t shirt. Rated 5 out of 5 by Terryg from Anatomical crew I bought this shirt to wear as an undershirt at work. It is very light hardly noticeable. Works well as everyday layer.